Global4cast has published a new study with the title “On the Thermodynamics of war and Social Evolution“, which provides the scientific explanation for patterns in war dynamics that were discussed in the preceding study “Patterns in War Dynamics” (2016). The dissipative structures the System produced can be depicted as “engines”. On the Thermodynamics of War and Social Evolution, presents a fundamentally different perspective on war and social evolution. • Tensions produced in the System constitute entropy and serve as a source of social order. 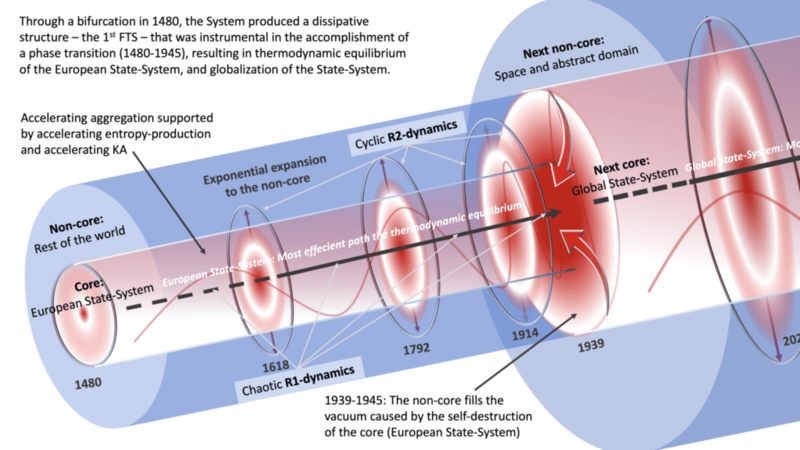 • During the period 1480-1945, the System produced a first dissipative structure that was instrumental in a phase transition and resulted in thermodynamic equilibrium in Europe; the core of the System during that period of time. • The first dissipative structure (1480-1945) was accompanied by four accelerating war-cycles; each cycle consisting of a relatively stable period, followed by systemic kinetic activity (systemic war). • Presently, the System is in the first war-cycle of a second dissipative structure (1945-….) that will be instrumental in accomplishing thermodynamic equilibrium at a global scale, in due time. • Social structures can be understood as “institutionalized” thermodynamic potentials. • Normally non-systemic wars the System produced – and still produces – are chaotic in nature. • In its basic responses, the System resembles a primitive organism. On the Thermodynamics of War and Social Evolution contributes to a most urgent discussion to improve our understanding of war and social evolution, to avoid the self-destruction of humanity. Source: On the Thermodynamics of War and Social Evolution.